German rye bread is famous for its outstanding flavor, aroma and texture. Typically baked fresh this farmers bread is a staple in German house holds – it stays fresh for a week! This bread is not that easy to make, first it takes 3 days to make it, and if you are not used to bake a bread using a starter, day two may sound a bit complicated: the well in the middle of the flours in the bowl and mixing in just that amount of flour to get the right consistency and around the well the rest of the flours not yet mixed in.... But maybe you get it right the first time?! Sprinkle the yeast into the water in a small bowl. Leave for 5 minutes and stir to dissolve. Mix in the flour and milk. Cover with a clean kitchen towel and let it ferment at room temperature for 12-18 hours. The mixture will get bubbly and fermented, that will be the starter. Sprinkle the yeast (1.5 tsp) into 1 cup of water in a small bowl. Leave for 5 minutes and stir to dissolve. Mix the two flours in a large bowl, make a well in the center and pour the dissolved yeast in it and the starter we made yesterday. With a wooden or ceramic spoon (no metal) slowly draw flour into the pond in the middle, until the liquids form a thick batter in the middle of the flour. Cover the bowl with a clean kitchen towel and let it 'sponge' at room temperature for 12-18 hours. The mixture in the middle of the bowl will rise and bubble. Add the salt to the batter in the bowl. Now mix in all the flour and add the rest of the water (0.5 cup) as needed to form a sticky and stiff dough. Knead the dough on a floured surface for about 10 min. Shape the dough into a loaf and place it on a floured baking tray. Cut two slashes in a X-form on top of the loaf. Cover the loaf with a kitchen towel and let it rise for about 1.5 hours – should get double in size. Bake in preheated oven for 1 hour 10 min. 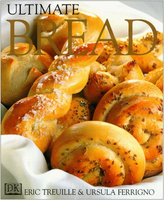 To keep the bread fresh, wrap it in a linen dish towel. Tip: it can happen that one forgets the timing and the dough has collapsed again after it rose. Easy: just knead the dough ones more for about 10 min and let it rise again for 1 to 1.5 hours – it even makes the bred slightly more puffy.